Bou Rachana stands in front of an image of slain husband Kem Ley. 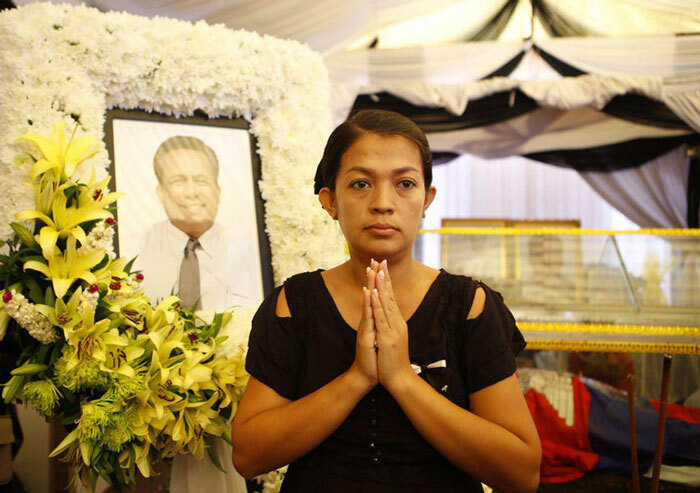 Bou Rachana, the widow of slain government critic Kem Ley, has decided to take matters into her own hands and has asked a leading Cambodian nongovernmental organization to prepare legal action related to the murder of her husband. “Dr. Kem Ley’s wife decided to seek a lawyer from CENTRAL to file a complaint to find justice for her husband,” said Moeun Tola, executive director of the Center for Alliance of Labor and Human Rights. CENTRAL is a labor-oriented NGO that aims to give Cambodian working people transparent and accountable governance for labor and human rights through legal aid and other actions. Kem Ley was gunned down in broad daylight on July 10 when he stopped in a Star Mart store in Phnom Penh where he liked to drink coffee with friends. While authorities charged former soldier Oueth Ang with the killing, many in Cambodia don’t believe the government’s story that he was killed by the former soldier over a debt. Just days before he was gunned down, Kem Ley had discussed on an RFA Khmer Service call-in show a report by London-based Global Witness detailing the extent of the wealth of the family of Prime Minister Hun Sen, who has ruled Cambodia for 31 years. Kem Ley was buried in southwestern Cambodia’s Takeo province two weeks later after a weekend funeral procession that drew around two million mourners. Deputy prosecutor and Phnom Penh Municipal Court spokesman Ly Sophanna who is handling the case, told RFA’s Khmer Service on Thursday that the prosecuting judge is continuing the government’s investigation. While the government investigation moves ahead, various nongovernmental agencies are gearing up for more action related to Kem Ley’s slaying and preserving his legacy, Moeun Tola told RFA. In addition to the legal action, NGOs are dividing up into groups that seek to explain the political and human rights situation in Cambodia to the national and international community, place a Kem Ley statue in Freedom Park in the capital, Phnom Penh, and safeguard Kem Ley’s family’s security. Reported for RFA's Khmer Service by Tin Zakariya. Translated by Yanny Hin. Written in English by Brooks Boliek.